I don't mean to sound dramatic, but a hasty introduction of your classroom library to your students could spell disaster for the future of your library. It could be doomed before it really even has a chance to live. Um, maybe I did mean to sound a little dramatic. 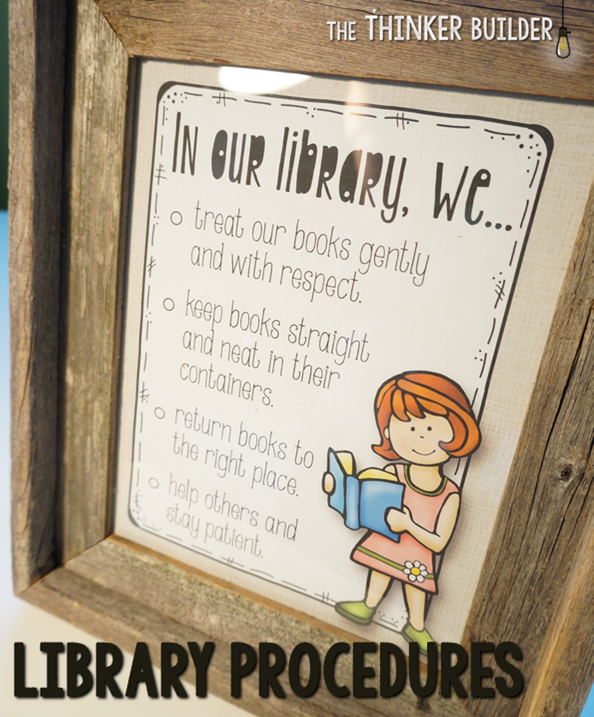 In the fifth and final part of my classroom library series, I'll share with you some ways to keep your library thriving throughout the year, but a HUGE piece to that is how your library is introduced to your students, so huge, that it gets its own whole post, right here in Part Four. For me, I admit that I tend to get a little protective of my classroom library. I spend the last week of summer arranging it and organizing it, and even stocking it a bit more. We develop a nice little connection, the library and me. And suddenly I'm about to let it go, like a daughter moving out on her own, like a butterfly released into the deep dark forest. Okay, now that's a bit dramatic. But still, I try to remind myself during those last days before the kids arrive, that this really isn't my classroom library. It's more theirs than mine. I'm just the curator. I should really start referring to it as our classroom library... maybe. So how do I go about introducing my our classroom library? 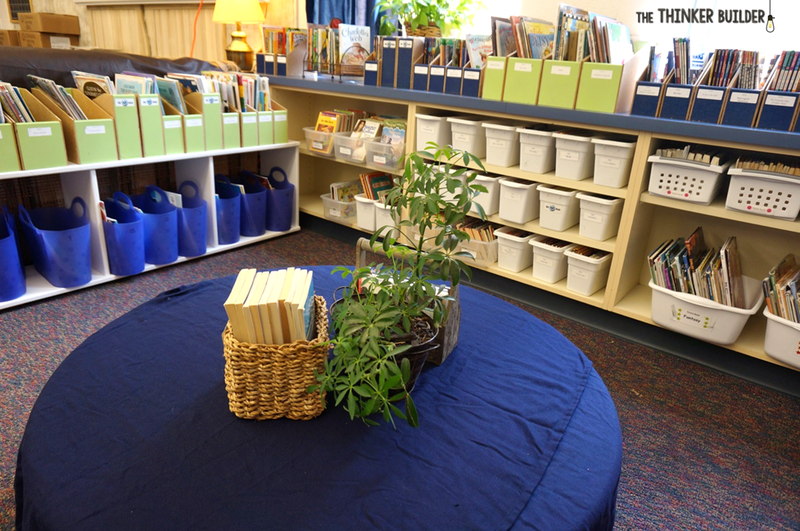 How do I tap into students' natural excitement about this charming little area I've set up? How do I focus their excitement into a desire to read the books within it? And how do I explain the library's "system" without that excitement slipping away? 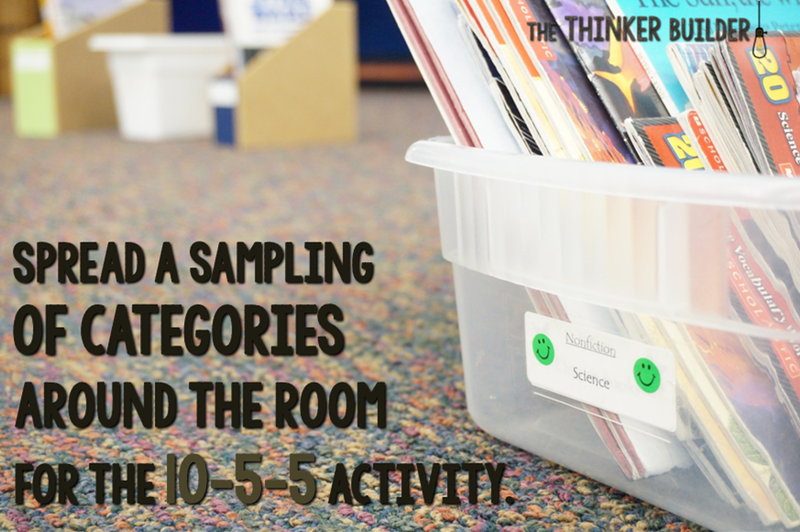 I've taken all the steps and the mini lessons that I use to help students get to know our classroom library, and I've organized them here into a five day plan. I don't always "stick to the script," of course, but I thought this might be a helpful guide to those who might just be starting out, as well as to those who are looking for a different perspective. not wanting to overwhelm students with too much information at once. Ahhhh, the first day. Deep breath. 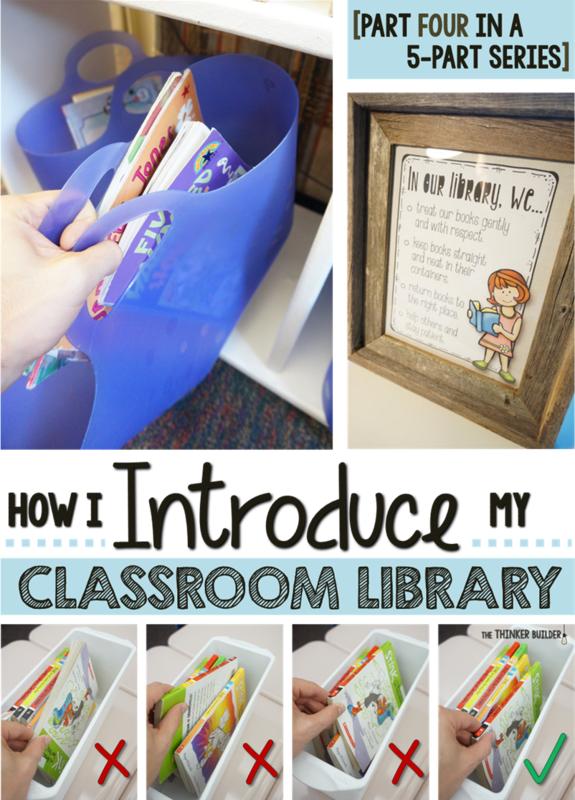 I kick off the introduction to the classroom library with a tour. I usually do it early in the afternoon, after we've gotten to know each other a bit and settled in. I gather students around the edges of the library area and say something cheesy, like, "Welcome to the best spot in the room." I can see on students' faces, how their eyes are darting around, that most of them are eager and stockpiling questions. I point out the main categories of books, pulling out an actual book or two with each one. For me, I show them the nonfiction bookcase, the author boxes, the series section, and the Realistic Fiction & Fantasy picture book tubs. I point out the gist of the labeling system. For me, I show how each container has a label that tells the specific type of book it holds, and how each book has a label that helps you return the book to its proper container. I'll show a couple of examples, but nothing too intense. The last thing I point out, mainly because any student who is paying the least bit of attention thus far has noticed them and is wondering about them, is why so many book containers are turned around and show a label that says, "On Hold." 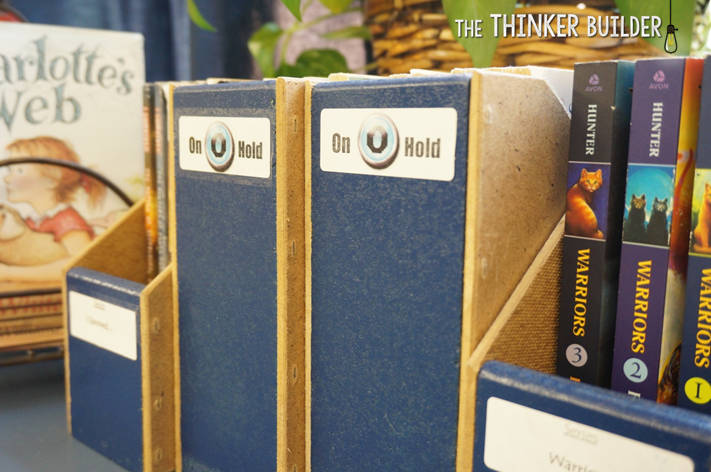 I have a lot more to say about the "On Hold" system, but for now, I just tell students, "A book container that has the 'on hold' label showing means you can't read those books... yet." A natural instinct that might follow a little tour-guide spiel like this would be to ask if there are any questions. I don't ask if there are any questions, because it just opens up the whole exact can of worms that I am trying to dish out slowly, in doses. 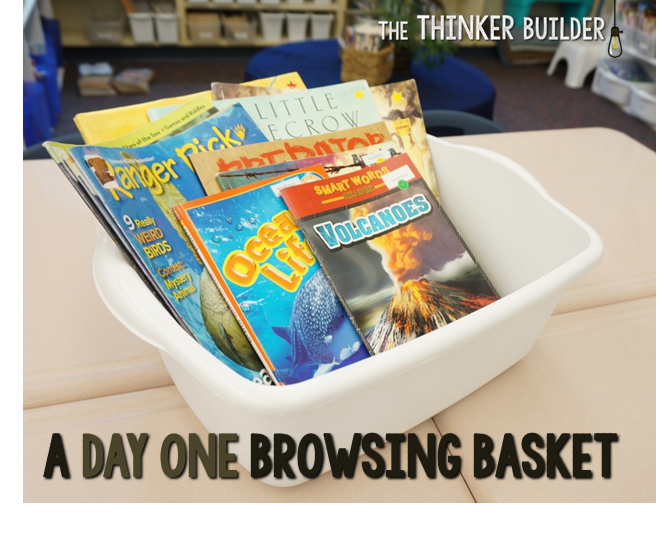 Next, I want to give students time to interact with some of the texts that we have in our library, but to (1) save time and congestion, and (2) avoid having to explain anything else, I send them back to their table groups and set out a "browsing basket" for each group. These are tubs of books that I have already set up. In each basket I've placed a few magazines, a few picture books, and a few nonfiction books (probably about 10-15 texts per basket, but if you're short on texts, you could do 6-8 and just rotate baskets a couple of times). For me, I don't pull chapter books, or books from "specialty" categories like a particular series or author. Why? Because I don't want to put all these books back into a million different spots. If I only pull from a few of my big categories, it's way faster to put them away. I give my third graders about twenty minutes of silent reading, broken up a few times with a "share something interesting with a neighbor" break. In day two, I want to give students more power to choose their own books to read, and to give them practice interacting with the library and how it's organized. The first activity I call, "10-5-5." Here's how it works: With students at their desks, I tell them they will be choosing some books in a moment. 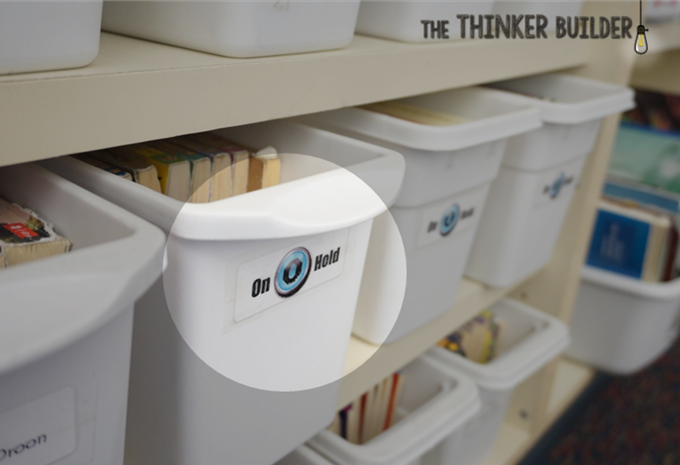 I start pulling book containers from the library and place them around the edges of the room. I do this with the students watching so I can give a quick blurb about each category I'm pulling. I spread them out to alleviate congestion, because all students will be "shopping" at once. I put out a good mix of 15 to 20 different containers... my nonfiction categories, a few chapter book series buckets, a few picture book author boxes, and maybe a couple more random ones like historical fiction. Now comes the "10" of the 10-5-5. I tell students to browse around the book containers that I've just set out and choose exactly 10 books that look interesting. They may not take more than two books from any one basket, and they need to put their 10 choices on their desk. Once students have returned to their seat with their 10 books, I bring out their individual book baskets. Since I don't allow students to keep our library books in the abyss of their desks, I give them each their own book basket. I've been using these plastic totes for five years now and they have held up great. 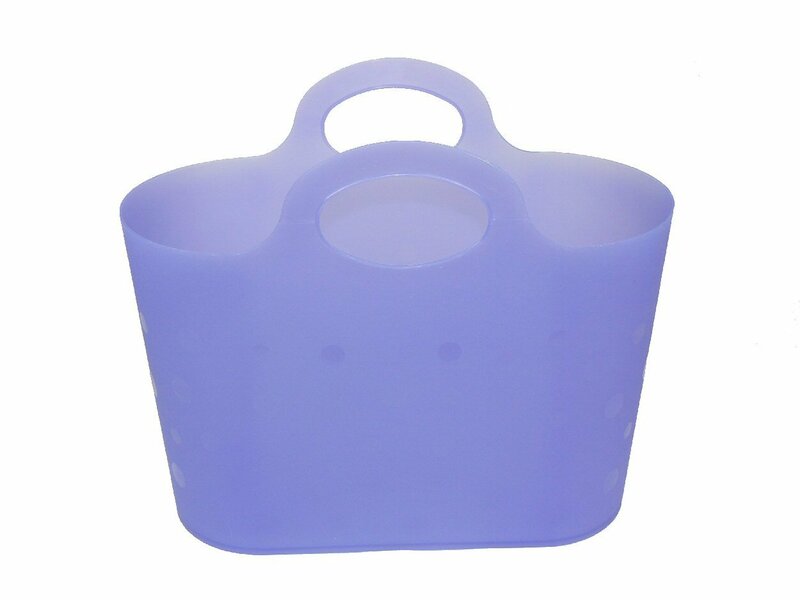 The plastic is flexible, the sides are nice and tall, and they hold plenty of books. I bought mine on sale from Michaels for about $4 apiece. I label the baskets with student numbers and pass them out. DO... keep around five books in it, enough to last you a whole day. DON'T... cram it full of books. Then I give directions for the first "5" of 10-5-5. I ask students to choose exactly five books from their stack of ten to put into their book basket. While they are making their decisions, I return the book containers to the library that I had spread around the room. Last, we get to the other "5" of 10-5-5. I have students take the five books not chosen to be in their book basket, and use them to practice returning books to the library properly. For this part, I camp out in the library area and call over one group at a time while the class is reading from their book baskets (and yes, it's okay with me if they read their "unchosen" five books while they are waiting). I give each group a few minutes to practice putting their five books back properly, having them help each other if needed so that we keep a brisk but focused pace. During the third day I want to focus on finding books to read from the classroom library. I start by bringing the class over to the library area again. On day one, I pointed out a few of the general categories the library had, but today I want to make sure I touch on all the different types of categories. In the very next sentence, I tell students not to worry about trying to remember where all the different categories are placed, that each one is labeled so they can find what they want later. Speaking of labels, I like to refresh students' memories by have a couple of volunteers model the steps one would take to return a book to its proper place. We also remind each other about the 5-book "guide" (not "limit") for their book baskets, and note that we shouldn't take more than two books from any of the smaller category boxes, like a popular series. And before I send students back to get their book baskets, I talk about the "On Hold" stickers in more detail. Keeping some of the library's book containers 'on hold,' (or, off limits), is going to play a big role in keeping our library thriving throughout the year, but here in the beginning of the year, it focuses students' attention on a more manageable, but still enticing, choice of books. I put the 'on hold' label on the back side of each container, with the category name on the front side. Then I simply turn the container around so the 'on hold' label faces outward. Then I send students to get their book baskets and read at their desk while each group gets a turn in the library, returning anything they are finished with and filling their book basket with fresh choices. By the fourth day, students now have a book basket filled with books of their choice. They may not need to "reload" every single day now, but I do want to teach students when to find and return books in the classroom library. We do a Daily 5 framework, and two of the basic procedures for our Read-to-Self (independent reading) time is to "stay in one place" and to "read the whole time." That means I do not allow students to visit our library during their independent reading time. So it's important that students have their book basket ready-to-go for the whole day in the morning. I have it as part of students' morning routine. So on Day Four, we have a "dry run" of prepping our book baskets for the day. It's also a good opportunity to practice the other parts of our morning routine. Sometime during the morning, we pretend that we start the day over. I even take everyone out to the hallway, as if they haven't even entered the classroom yet. When students re-enter, they read the morning message on the board, which now includes, "Make sure your book basket is ready for the whole day!" We talk through this a bit, making sure students know that this entails actually getting your book basket, looking through what's in it, what you're currently reading, what you'll be reading next, and asking yourself, "Do I have enough to read? Is there anything I'm finished with?" As students finish their practice session, I tell students to expect this to be part of their REAL morning message tomorrow. The other task I like to do at some point on the fourth day is setting up our list of library procedures that will be posted. I don't like to do this too early. I think it's helpful for students to get a few days with the library under their belt so they can take a little ownership. And it's helpful for me to observe what's working and not working with this unique group of students, so that I can emphasize certain topics in our procedures. Click the picture for a free copy. Return books where the belong. Help each other and stay patient with each other. To the right you'll see what I'm hoping to use this year (unless our class discussion takes us in a completely different direction... fingers crossed). 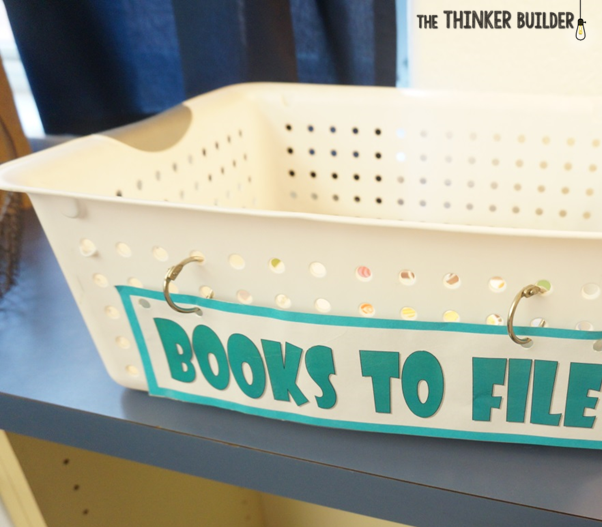 Now that our library procedures have been set up, and students have a common understanding of how to use their book basket and when and where to find and return books, I can continue transitioning my focus onto building Read-to-Self stamina and other mini-lessons that may not directly involve the library. On the fifth day, students get their book basket ready for the whole day as part of their morning routine. I show them the printed version of the library procedures we discussed yesterday, and we briefly review each one by brainstorming examples of situations that meet the procedure and some that don't meet the procedure. Thus far, the only influence I've had on the books students' are actually choosing is using the 'on-hold' system to temporarily close off many of the containers. Now that students are familiar with the physical process of getting a book, I like to have a lesson on choosing "good fit" books. (I think the term "good fit" came from the authors of The Daily 5, Gail Boushey and Joan Moser.) Otherwise known as "just right books," I want to teach students real-life strategies to use in order to choose mostly good fit books. I'm not going to go through the whole lesson here in this post, but my basic goal is to make sure my kids know that reading "good fit" books most of the time will make a huge impact in becoming better readers. "Too easy" books and "too challenging" books also have their valid places, but "just right" is what I want to make sure they know how to find. While students are reading from their book baskets today, I start to meet with students one-to-one and start to learn about each of them as a reader. We look in their book basket, chat a bit, and then I have them read a little bit out loud from whatever they want. Low key, no fancy note-taking, just building a reading relationship. And on the sixth day, I rest. Or is that supposed to be the seventh day? If you'd like to grab a 'cheat sheet' of the mini lessons I talked about, click HERE. Please keep in mind that it's just the bare bones of what I talked about here for each day, not full plans. 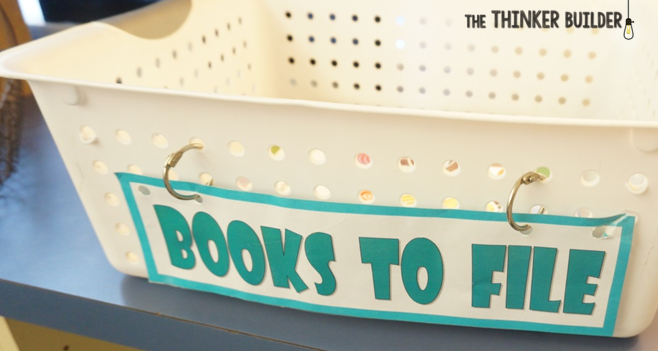 Coming in my fifth and final part of my classroom library series is everything I've learned about keeping my classroom library thriving throughout the year, so you can maintain a living, breathing, changing, growing, organized library for more than just a few weeks. See you then!